When and how will you receive your paper? How do we assure you of the quality of your paper? What constitutes a page for paper orders? We call our small writing company Essay Tips. Currently, we have several resident writers who regularly contribute articles to our website. They also handle our writing services for our clients. 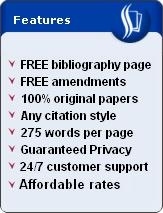 We offer free tips on writing academic papers and writing services for a reasonable price. You can hire us to write model papers. We update our website regularly, giving fresh information straight from your browser. We offer writing services, including writing services for your essays, research papers, case studies, course works, and article reviews and summaries just to name a few. You name it, we will work on it. While our rates depend on the number of pages and the deadline, we offer a very reasonable price without sacrificing quality. We also offer discounts to regular and new clients. Our rates are flexible; you can bargain for the price by sending us an email or by talking to us via Gmail chat. The soonest time. We strive to give you the final output before your deadline. After payment has been made, we'll send you the document immediately. You will receive the document through email. A very good question. Our answer is simple. You can request for a free sample of our work by sending us an email. We highly encourage our clients to tell us any slight changes that they want to be made on their papers before the deadline. We also inform our clients about the writing progress of their orders. The free tips and other articles that we publish here in Essay Tips are direct proofs that we are committed to topnotch writing. A page consists of 250 words for double-spaced papers and 500 words for single-spaced writing orders. Font size is 12 and font style is Times New Roman. Margins are 1-inch on all sides. These are subject to change depending on your specifications. First, we offer very reasonable rates. Second, we know how things work. Our team of writers have been professionals for more than five years. We know how to get things done properly. Unlike other writing companies, our approach is simple yet effective: we aim for a personal dedication to writing your papers. You just can't get that from large writing companies that employ freelancers who are located just about anywhere in the world and, therefore, who hardly have direct contact with their office. We know because our writers have vast experiences and are knowledgeable in the writing profession. We have a small office so we can keep our work tight. Third, we do not recycle old papers, which means our papers are original and free from plagiarism. And fourth, we talk small but work big. As of this moment, we generally do our transactions with our clients through email, including payment details and requests, questions and updates. Since our writers are online 24/7, you can be assured that we will read your emails and respond to them immediately. For now, we only accept payments through PayPal. 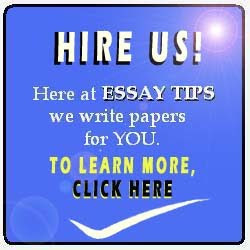 You can get in touch with us by sending us an email at essaytips@gmail.com. For more details, visit our hire us page.